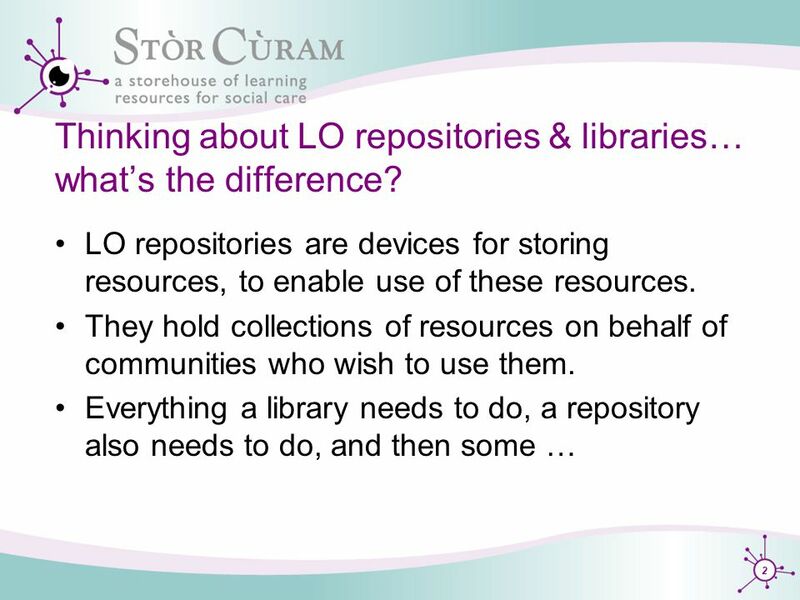 Information Professionals and Learning Object Repositories … more than just metadata quality … Sarah Currier Stòr Cùram Project Librarian JISC X4L Repository. 8 8 Why is metadata important? 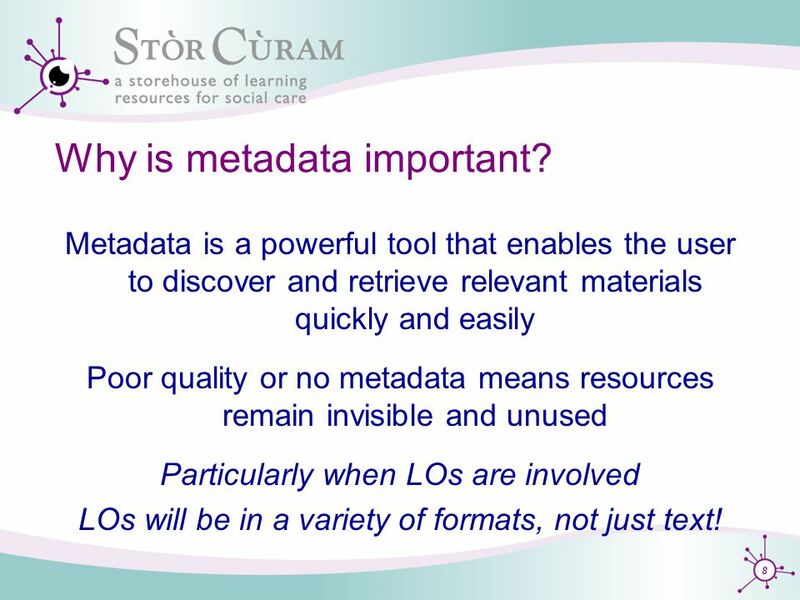 Metadata is a powerful tool that enables the user to discover and retrieve relevant materials quickly and easily Poor quality or no metadata means resources remain invisible and unused Particularly when LOs are involved LOs will be in a variety of formats, not just text! 9 9 Isn’t all this obvious? Not in the e-learning community! 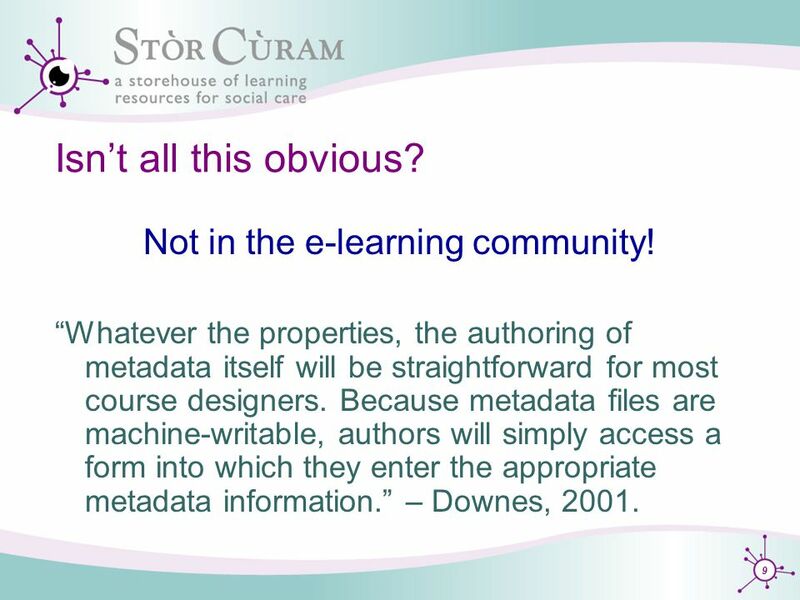 “Whatever the properties, the authoring of metadata itself will be straightforward for most course designers. Because metadata files are machine-writable, authors will simply access a form into which they enter the appropriate metadata information.” – Downes, 2001. 10 10 Isn’t all this obvious? Not in the e-learning community! 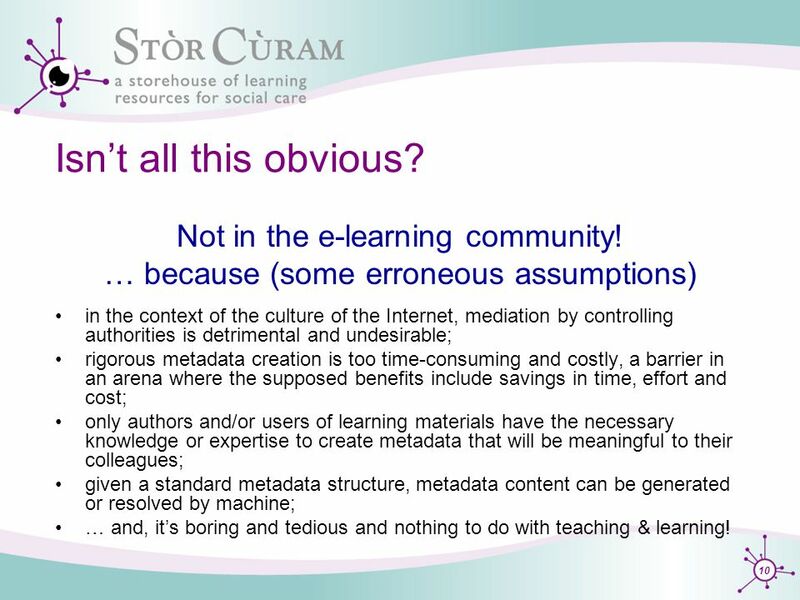 … because (some erroneous assumptions) in the context of the culture of the Internet, mediation by controlling authorities is detrimental and undesirable; rigorous metadata creation is too time-consuming and costly, a barrier in an arena where the supposed benefits include savings in time, effort and cost; only authors and/or users of learning materials have the necessary knowledge or expertise to create metadata that will be meaningful to their colleagues; given a standard metadata structure, metadata content can be generated or resolved by machine; … and, it’s boring and tedious and nothing to do with teaching & learning! 11 11 Isn’t all this obvious? Not in the e-learning community! 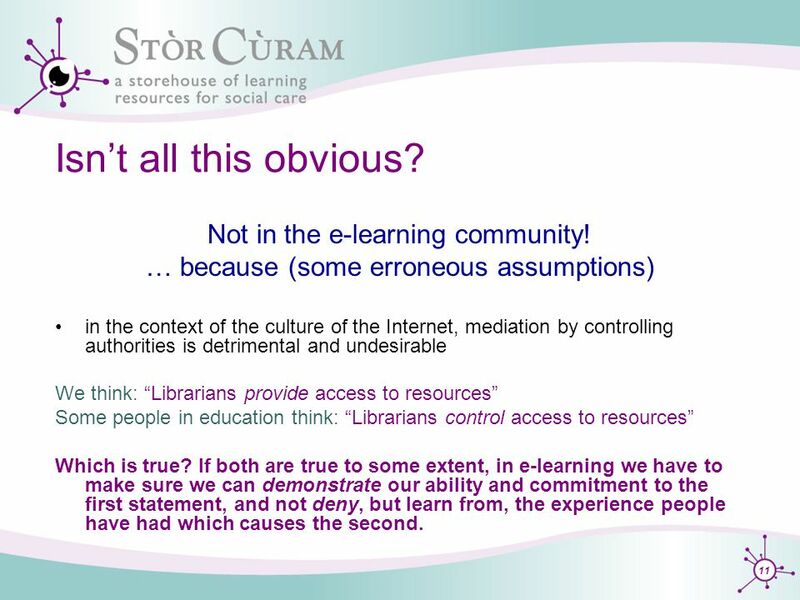 … because (some erroneous assumptions) in the context of the culture of the Internet, mediation by controlling authorities is detrimental and undesirable We think: “Librarians provide access to resources” Some people in education think: “Librarians control access to resources” Which is true? 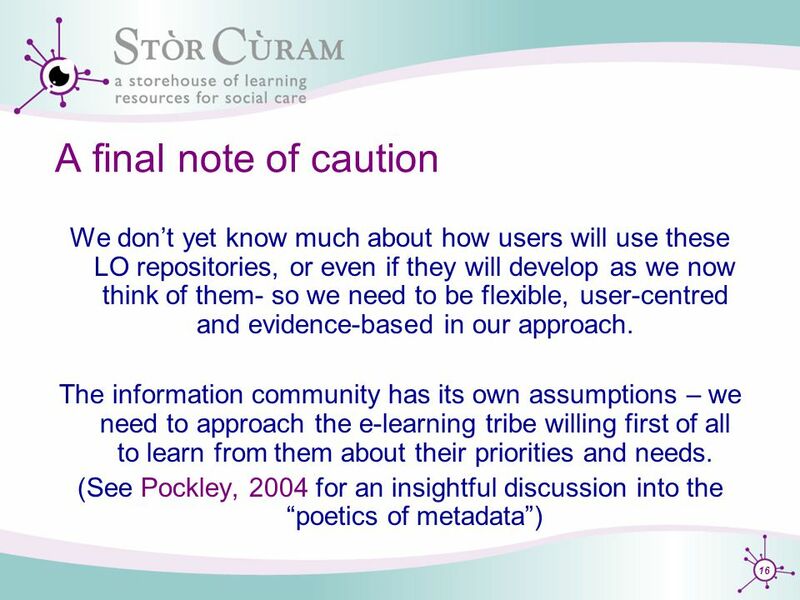 If both are true to some extent, in e-learning we have to make sure we can demonstrate our ability and commitment to the first statement, and not deny, but learn from, the experience people have had which causes the second. 12 12 Isn’t all this obvious? Not in the e-learning community! 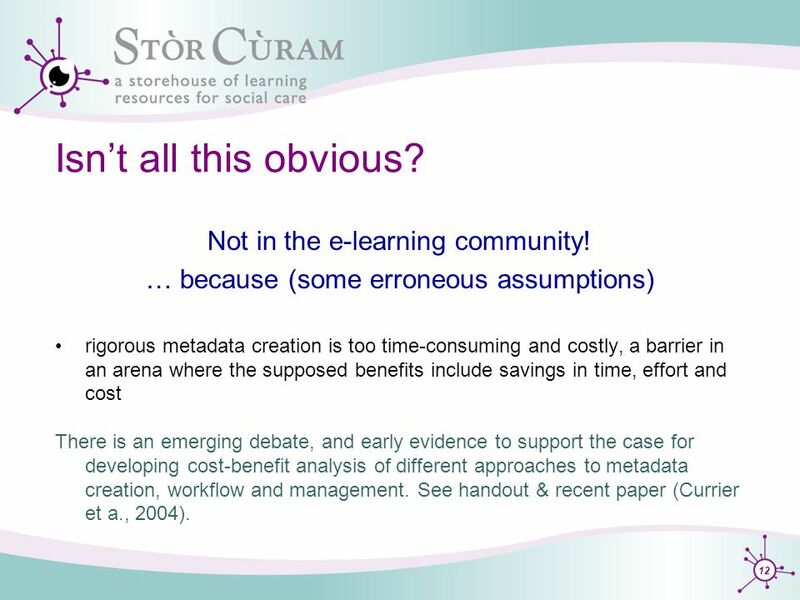 … because (some erroneous assumptions) rigorous metadata creation is too time-consuming and costly, a barrier in an arena where the supposed benefits include savings in time, effort and cost There is an emerging debate, and early evidence to support the case for developing cost-benefit analysis of different approaches to metadata creation, workflow and management. See handout & recent paper (Currier et a., 2004). 13 13 Isn’t all this obvious? Not in the e-learning community! 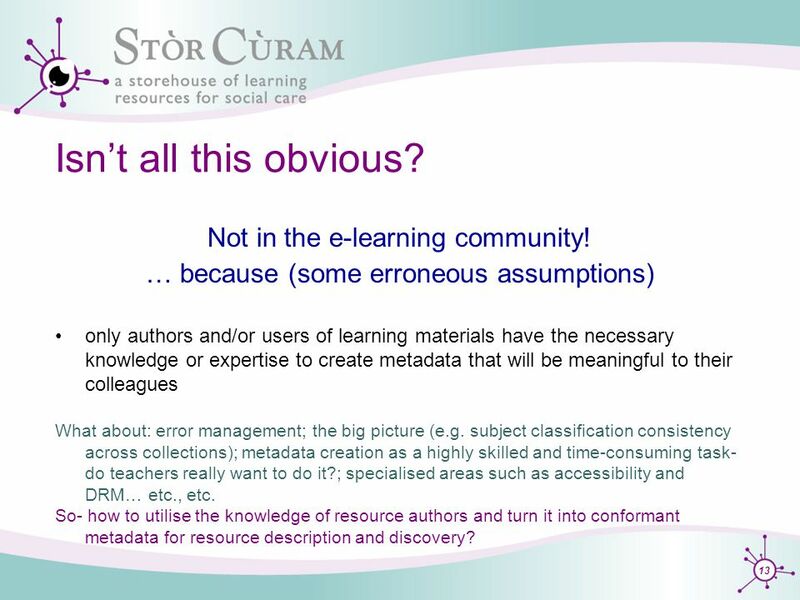 … because (some erroneous assumptions) only authors and/or users of learning materials have the necessary knowledge or expertise to create metadata that will be meaningful to their colleagues What about: error management; the big picture (e.g. 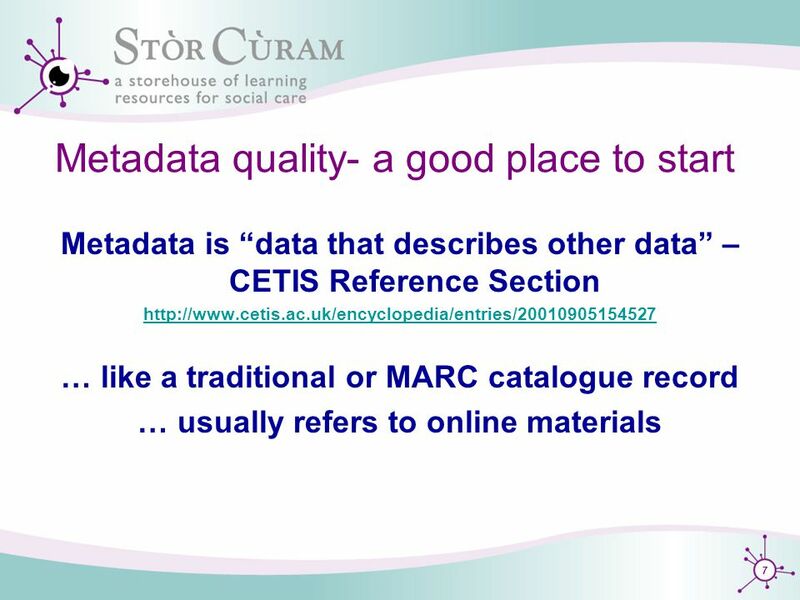 subject classification consistency across collections); metadata creation as a highly skilled and time-consuming task- do teachers really want to do it? 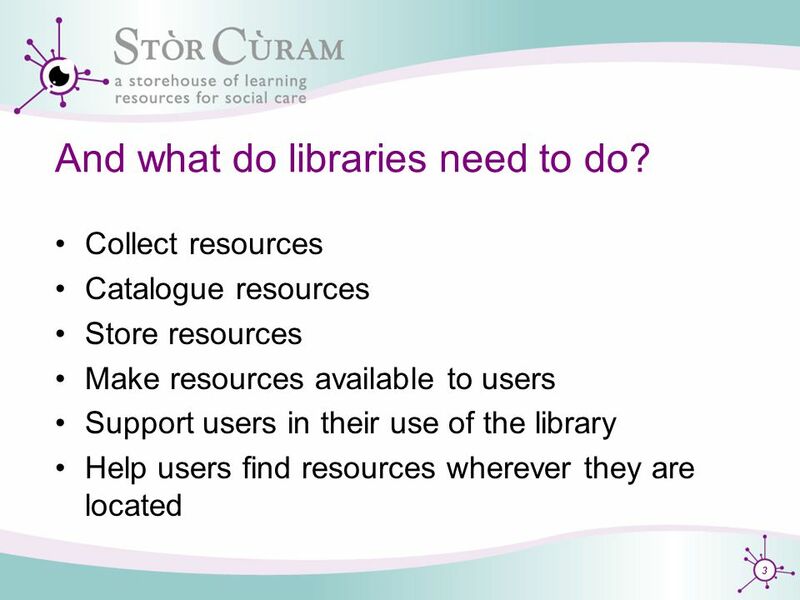 ; specialised areas such as accessibility and DRM… etc., etc. 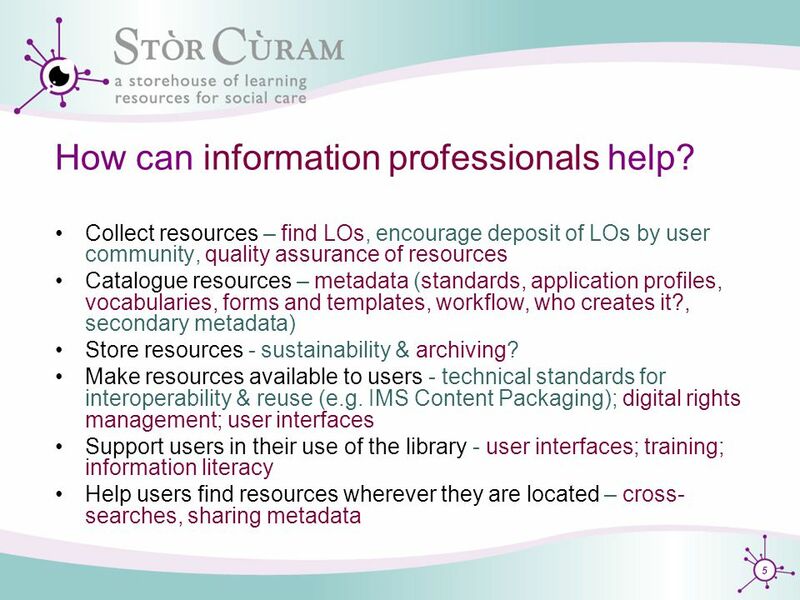 So- how to utilise the knowledge of resource authors and turn it into conformant metadata for resource description and discovery? 15 15 Isn’t all this obvious? Not in the e-learning community! 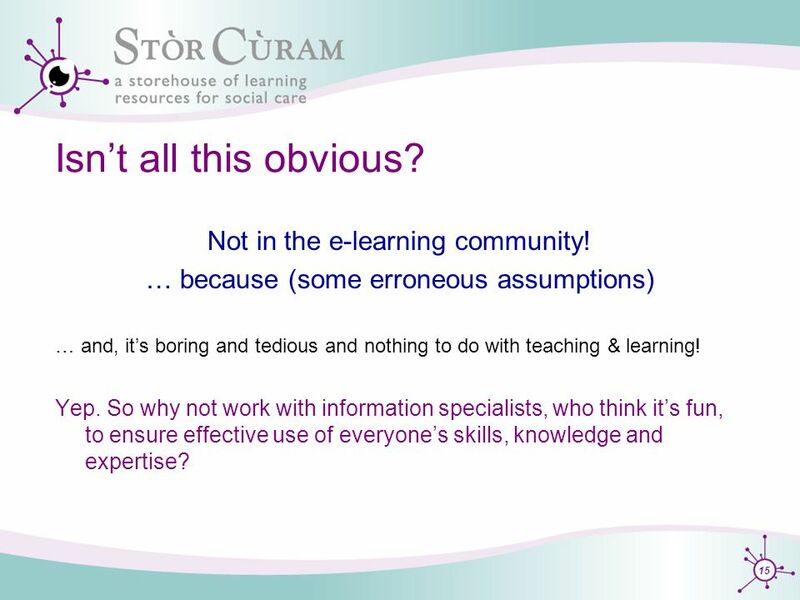 … because (some erroneous assumptions) … and, it’s boring and tedious and nothing to do with teaching & learning! Yep. So why not work with information specialists, who think it’s fun, to ensure effective use of everyone’s skills, knowledge and expertise? 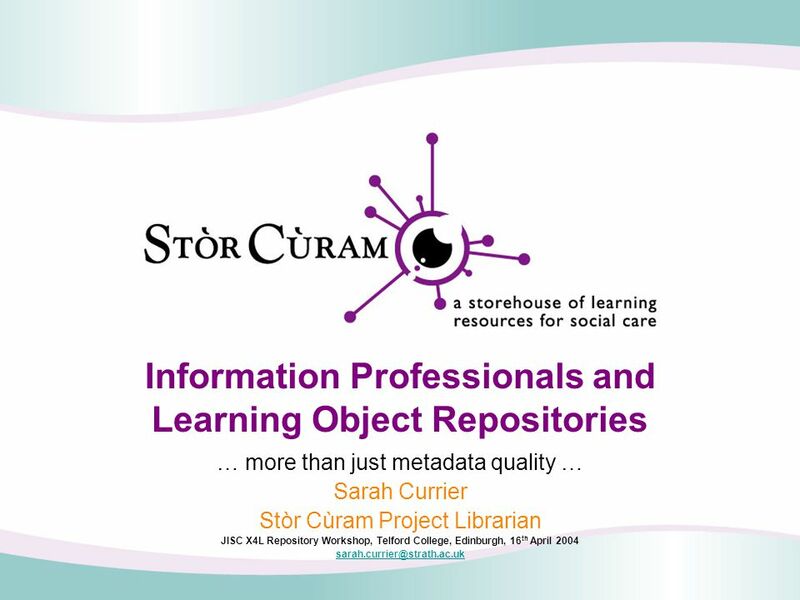 Download ppt "Information Professionals and Learning Object Repositories … more than just metadata quality … Sarah Currier Stòr Cùram Project Librarian JISC X4L Repository." 1 of 15 Information Access Internal Information © FAO 2005 IMARK Investing in Information for Development Information Access Internal Information. 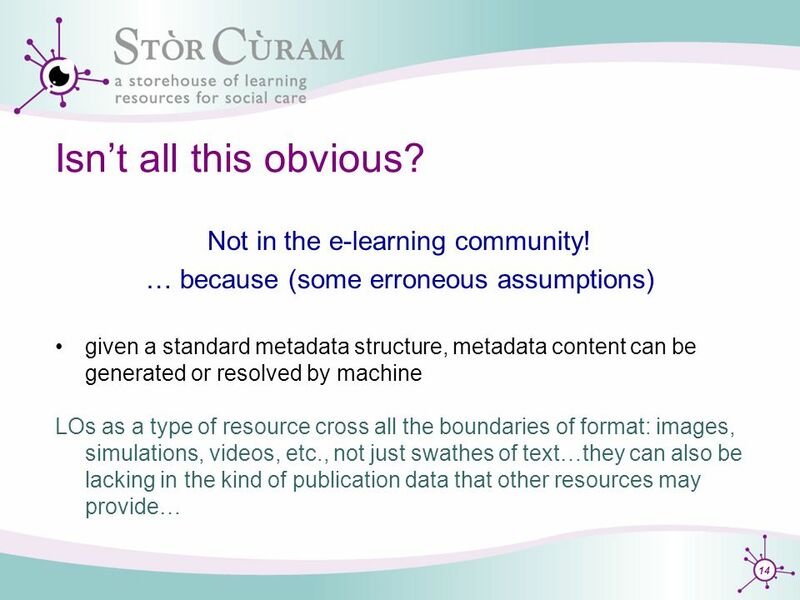 Building Quality Assurance into Metadata Creation An Analysis Based on the Learning Objects and e-Prints Communities of Practice Jane Barton, Centre for. Improving Learning Object Description Mechanisms to Support an Integrated Framework for Ubiquitous Learning Scenarios María Felisa Verdejo Carlos Celorrio. Philip LordDigital Archiving Consultancy Alison Macdonald Digital Archiving Consultancy Liz LyonDigital Curation Centre David GiarettaDigital Curation. 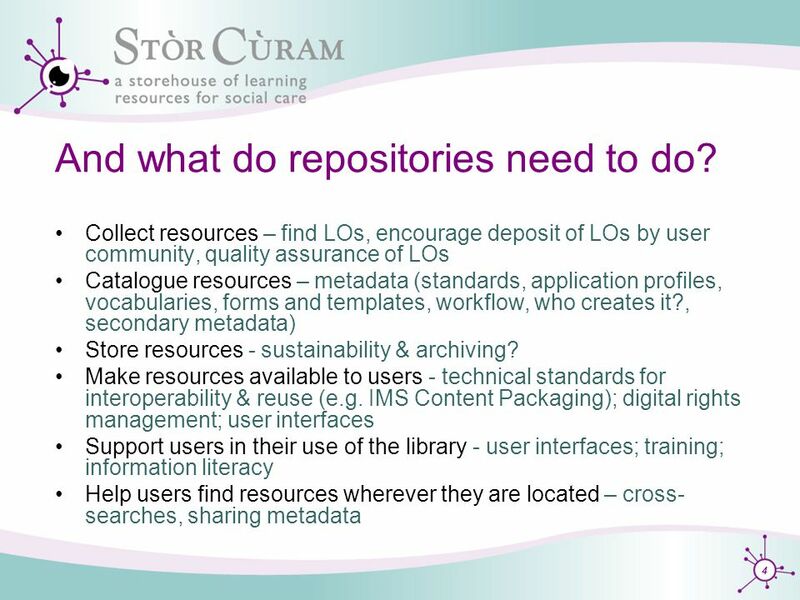 Supporting education and research Repositories in Context Digital repositories as components of an integrated infrastructure for education Leona Carpenter. 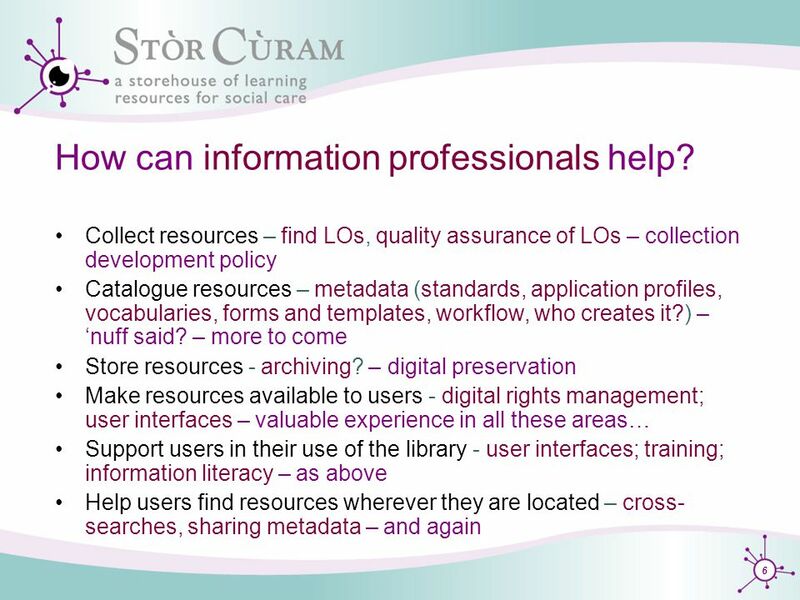 Optimising metadata workflows in a distributed information environment R. John Robertson & Jane Barton Centre for Digital Library Research University of. An overview of collection-level metadata Applications of Metadata BCS Electronic Publishing Specialist Group, Ismaili Centre, London, 29 May 2002 Pete. Introduction to metadata for IDAH fellows Jenn Riley Metadata Librarian Digital Library Program.